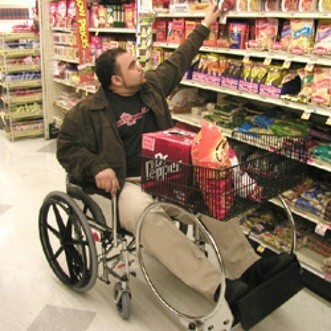 Title III of the Americans with Disabilities Act (ADA) prohibits discrimination against people with disabilities by public accommodations, which are private businesses open to the public. The ADA requires public accommodations to be designed, constructed, and altered in compliance with the ADA’s accessibility standards. Places of exercise or recreation (e.g. , gymnasiums, health spas, bowling alleys, golf courses). Provide goods and services in an integrated setting, unless separate or different measures are necessary to ensure equal opportunity. Eliminate unnecessary eligibility standards or rules that deny individuals with disabilities an equal opportunity to enjoy the goods and services of the public accommodation. Make reasonable modifications in policies, practices, and procedures that deny equal access to individuals with disabilities, unless a fundamental alteration would result in the nature of the goods and services provided. Furnish auxiliary aids when necessary to ensure effective communication, unless an undue burden or fundamental alteration would result. Remove architectural and structural communication barriers in existing facilities where readily achievable. Provide readily achievable alternative measures when removal of barriers is not readily achievable. Provide equivalent transportation services and purchase accessible vehicles in certain circumstances. Maintain accessible features of facilities and equipment. All newly constructed public accommodations must be accessible to individuals with disabilities to the extent that it is not structurally impracticable. The new construction requirements apply to any facility occupied after January 26, 1993, for which the last application for a building permit or permit extension is certified as complete after January 26, 1992. Full compliance will be considered “structurally impracticable” only in those rare circumstances when the unique characteristics of terrain prevent the incorporation of accessibility features (e.g., marshland that requires construction on stilts). Relocating activities to accessible locations. Extra charges may not be imposed on individuals with disabilities to cover the costs of measures used as alternatives to barrier removal. Alterations after January 26, 1992 to existing places of public accommodation must be accessible to the maximum extent feasible. An alteration is a change that affects usability of a facility. For example, if during remodeling, renovation, or restoration, a doorway is being relocated, the new doorway must be wide enough to meet the requirements of the ADA Accessibility Guidelines. When alterations are made to a “primary function area”, such as the lobby of a bank, an accessible path of travel to the altered area, and the bathrooms, telephones, and drinking fountains serving that area, must be made accessible to the extent that the added accessibility costs are not disproportionate to the overall cost of the original alteration.